Easy with slight elevation, rocky footing in areas. 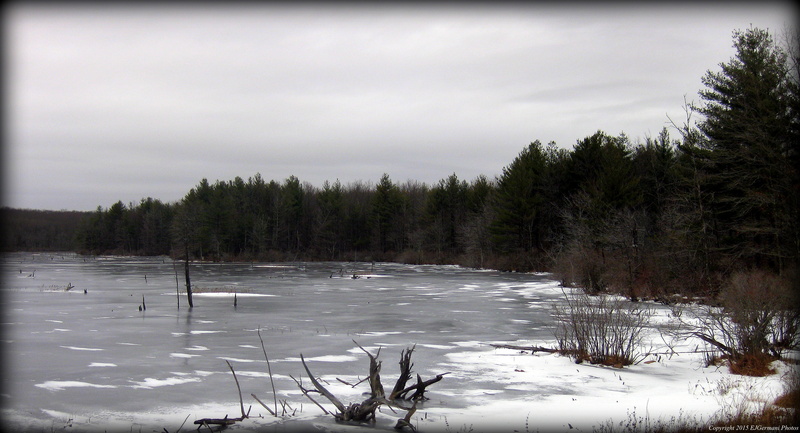 Nestled in the northwest corner of Rhode Island just west of Wallum Lake is the Buck Hill Management Area. This vast piece of property, a haven for hunters and hikers, is pure seclusion. At times you are literally miles from any civilization and it is easy to appreciate what nature has to offer here. I was joined by a group of hikers for this stroll on this gray January morning. The temperatures were bearable, however the trails were very icy, slowing our usual pace. We started from the second parking lot where the gate is. From here we headed north along the access road. Soon we came to the first intersection. We continued straight along the access road. The road to the left would be our return route. We soon crossed a small brook before coming to the next fork. The access road veers to the right. At this point we choose to stay to the left and started following the yellow blazed trail. This trail was rather rocky for most of its length. We then came to an opening on the left. Here is a marsh, part of Lesson Brook. Although we saw none this morning, I would imagine this would be a good spot to view water foul. We continued along the yellow blazed trail passing areas of hemlocks and mountain laurel, passing an old fire road, before coming to an area with some stone walls. Here, atop a rather high hill, looks as if there may have been a structure at one time. We then continued along the yellow trail and came to Old Starr Road. The road is very obvious as it is a small valley between the roads embankments and stone walls. From here we turned left, heading west, down the hill. Soon we came to a fork. We followed the road to the left. From here we followed this road to its end, winding gently uphill for a bit. The road follows the ridge line of Benson Mountain for about a mile. There are several paths off of the main road that lead to several fields along the way. The road then bears left and downhill to its end. Turning right we retraced our steps along the access road back to the parking area. This area is open to hunting and orange must be worn during hunting season. Trail map can be found at: Buck Hill.